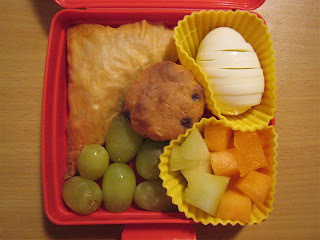 This week, I decided to try Shaun's advice that it was a much better idea to feed the children the same lunch if at all possible to cut down on my workload. I also had a recipe I wanted to try for "bourek". Basically, it is a Turkish or Algerian pastry stuffed with meat and spices. Most recipes called for ground meat (ie. chicken, lamb, or beef) and, although I'm sure lamb is more authentic, no one here will eat lamb and I'm not about to cook it either. Lambs are too cute to be on our table, sorry. The recipe in and of itself was easy and F&B were my taste testers right out of the oven. Faith loved it, Ben seemed to like it, but he also wanted to nap and wasn't exactly the most willing participant. But the result was pleasing and Shaun tried them later on as well. He thinks they need a dipping sauce but neither of us are sure what kind of sauce. Ideas? 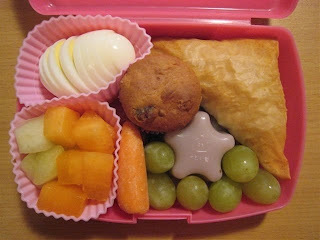 Faith has one bourek, a boiled egg, chopped melons, a blueberry muffin, carrot sticks, grapes and a grape star pudding. For those who have asked about the puddings, I buy them at the Oriental grocery. They come in a big jar of individual packages and the kids love them, but that is about all I know about them. Ben has a bourek, a boiled egg, a blueberry muffin, chopped melons and grapes. No carrots or pudding for him. He gags on raw carrots (sensitive gag reflex) and the puddings seem like too much difficulty in a preschool room. He doesn't know what she takes anyhow. I enjoy reading your blog, I am a newbie at Bento making, and was wondering, how do you get your sandwich bread to stay together (not crack)? I make PB&J for our two and I use wheat bread, and it always cracks!!! Thanks so much, and keep them coming I am a SAHM and like doing different things for our two girls. My question is about putting meat (like the ground beef) for a cold lunch. My 2 year old is in Preschool and no fridge is easy (frozen fruit.) But I worry about unheated meats. I may be being silly. Maybe a yogurt based dip? I'm thinking thick yogurt, like Athenos, with some dill and maybe a little garlic? Thanks Jenn! We have the Smucker's Natural PB, and we leave it in the fridge so it doesn't separate as much.